For the next issue of Australian Country we visit the spectacularly located Bandana cattle station in central Queensland, a wonderful artist’s home and studio in South Australia and a peaceful garden in Victoria’s Castlemaine district. 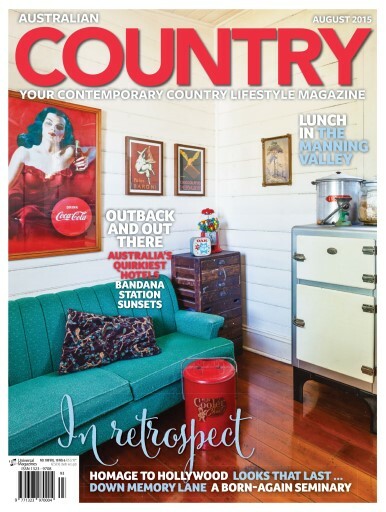 We’re inspired by a delightfully retro cottage in outer Sydney, a wonderfully historic former seminary and artist’s home at Rydal in the NSW Central Tablelands and fashion to keep us cheerful through the end of winter. Our cooking feature celebrates the tangy delights of lemons and our travel story realises our wildest dreams with quirky places to stay ranging from a treehouse to a train carriage. Setting the Scene celebrates the Indian tradition of tiffin and the product story showcases all the latest fittings and accessories for bathrooms.